The Macheesmo household is finally starting to settle down after a winter filled with a new baby and all that comes with it. I’ve been taking an absurd amount of photos on my phone to try to hang onto these moments. I finally had the time this week to buzz through them and put together a Snippets post for those who are interested! Our little girl is already showing so much personality and she’s so different from Theo. Theo was always (and still is) a bundle of energy and emotion. He’ll go from dying laughing to crocodile-tears crying in a matter of minutes. Darby seems more even, and to be honest, she seems a bit more like me in that regard. She’s mostly just chill and seems happy almost all the time. 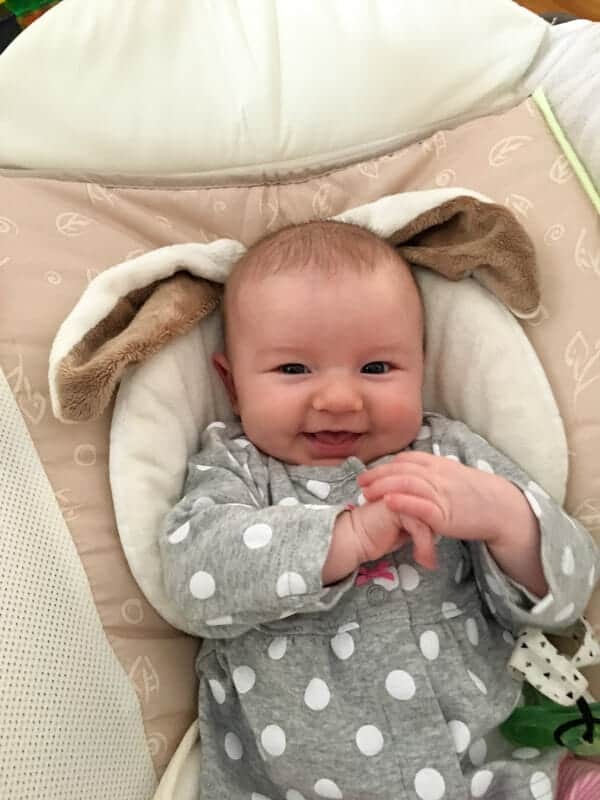 Who doesn’t love a happy baby right?! It has been unseasonably warm in Denver this winter so we’ve even had some opportunities to show her around the neighborhood. 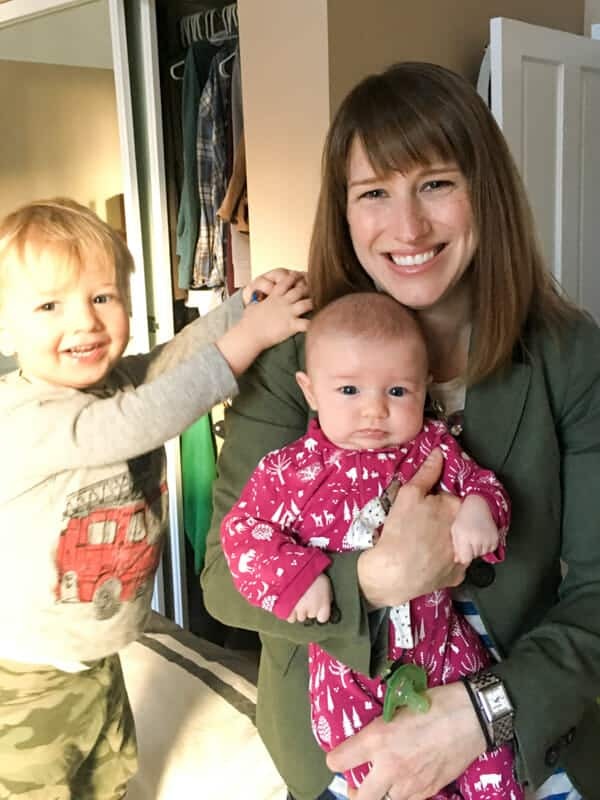 While Bets was on maternity leave, the house schedule was pretty chaotic most days, but she went back to work a few days ago which means the kiddos are off to daycare during the day and we’ve finally been able to establish a reasonable schedule. Before Betsy went back to work, I got into the habit of giving Darby a bottle at night to try to get her used to it. 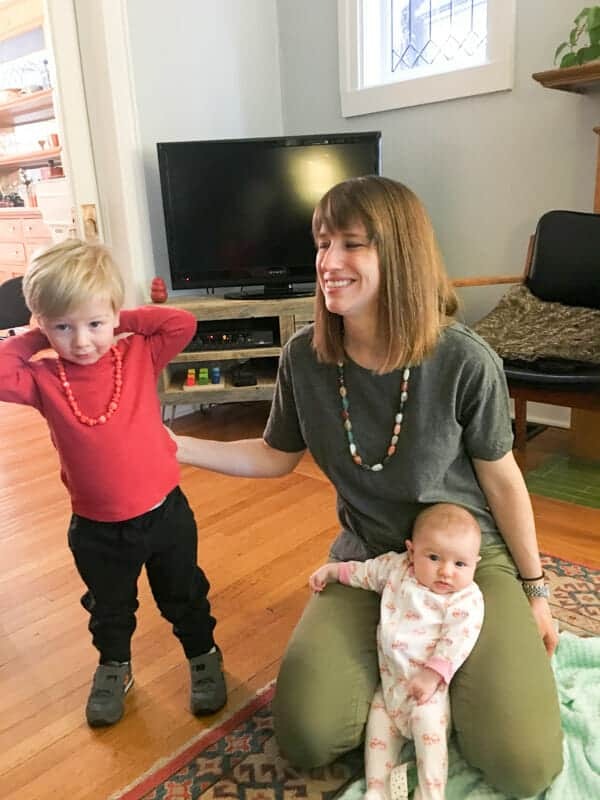 I really liked the time with her and Theo liked that I couldn’t move for 20 minutes so he could ask me approximately 1 million questions about babies. 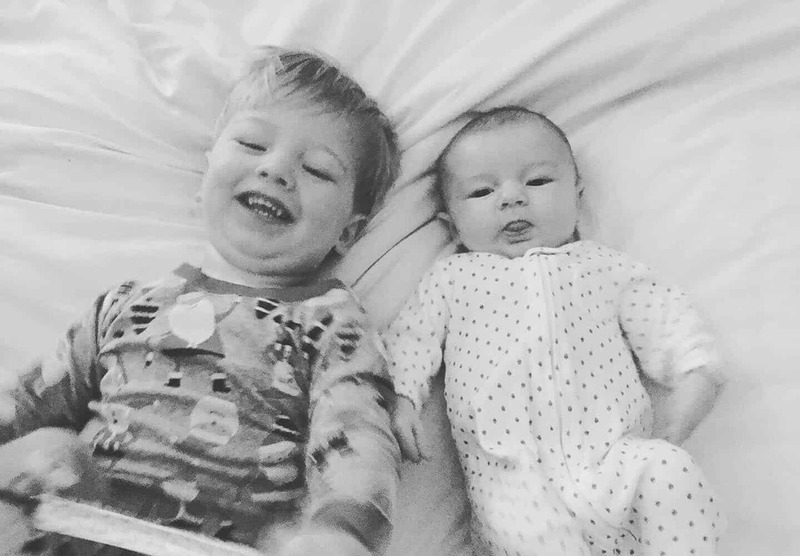 The thing that is mind blowing to me now with two kids is the morning routine. 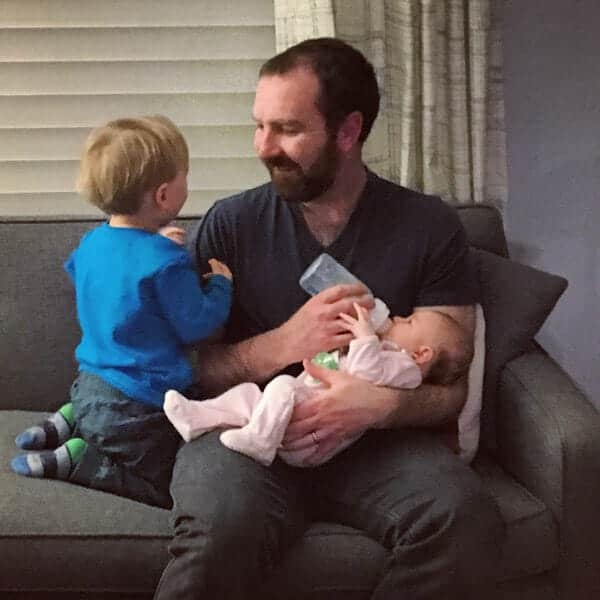 The first thing that amazes me is that there was a time in my life, not too long ago, when I had zero kids and had to be at work at 9:30AM and sometimes struggled to make it. What in the hell was I doing with my morning?! These days we have to out the door at 7:45AM and sometimes we still have time for photo ops! Theo has learned that flare is all about accessories and will raid Momma’s necklaces now in the morning. Now we just need to teach him that monochrome isn’t exactly a good look. We had so many birthdays this winter! 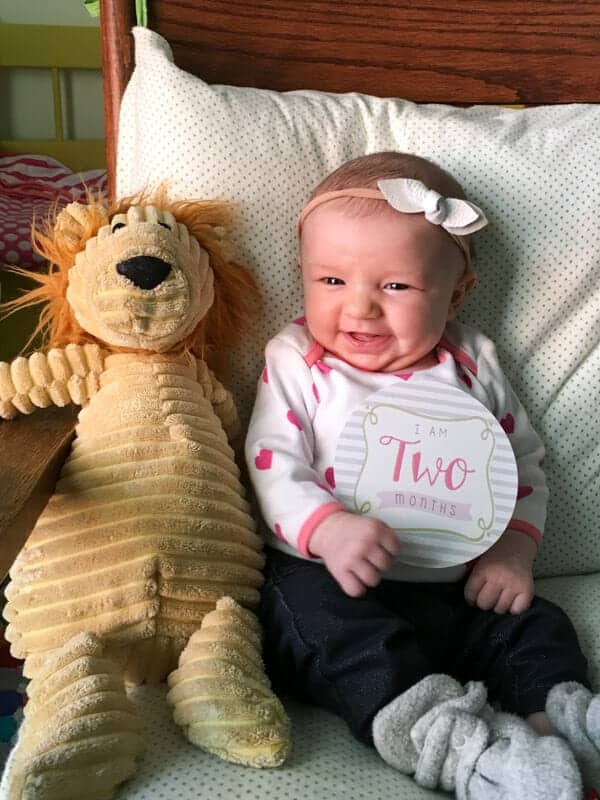 Darby turned two months (and three months)! I didn’t have a three month photo ready when I wrote this but this two month one is pretty indicative of her personality. Theo, meanwhile, turned two YEARS old which is sort of mind blowing to me. For his two year birthday, the pacifier fairy came and whisked away all his pacifiers. 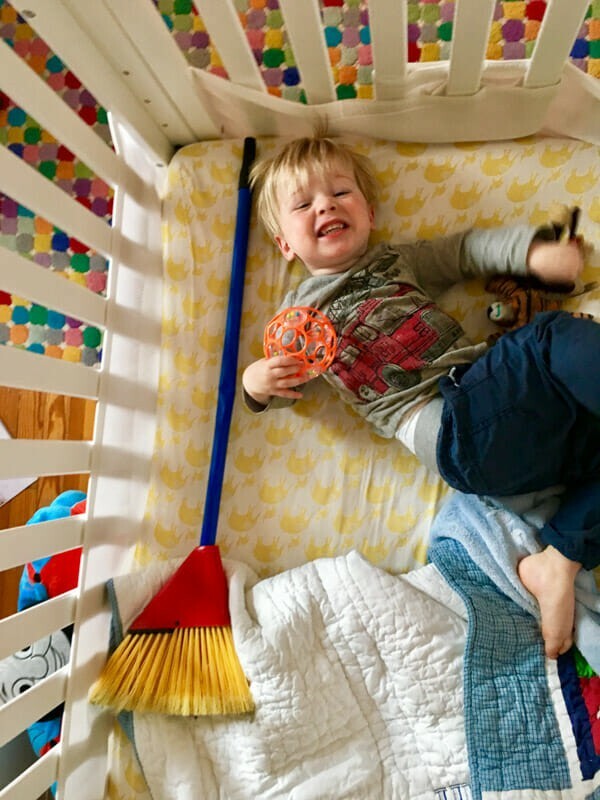 He was able to replace them in his crib with whatever he wanted. To top it off, I turned 34. YIKES! For perspective, I started Macheesmo when I was 25. 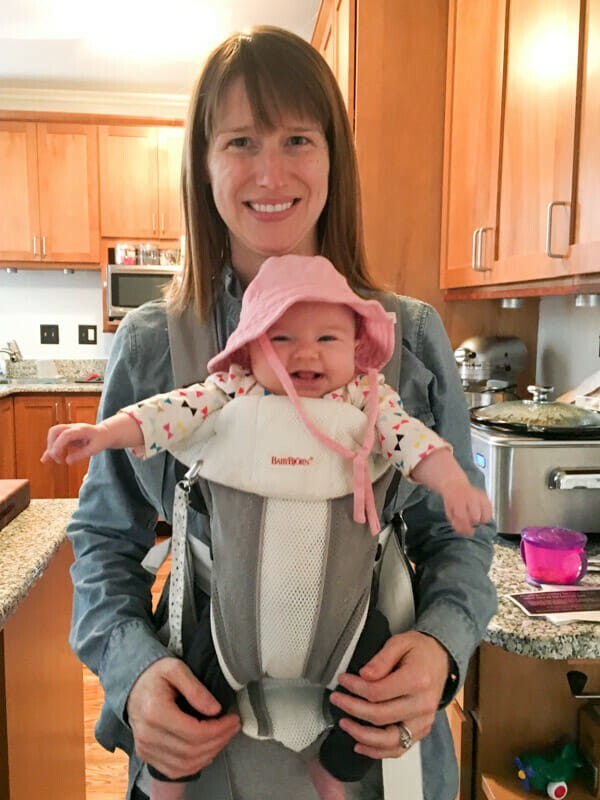 It has been almost a decade of blogging! 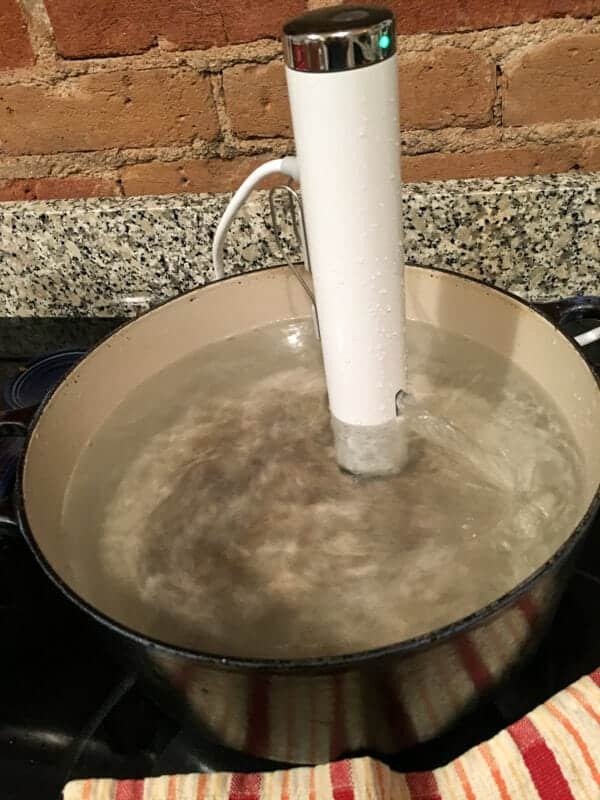 I rewarded myself with a kitchen tool I’ve been eyeing for a while, a Joule sous vide machine! Not cheap at all, but pretty cool. 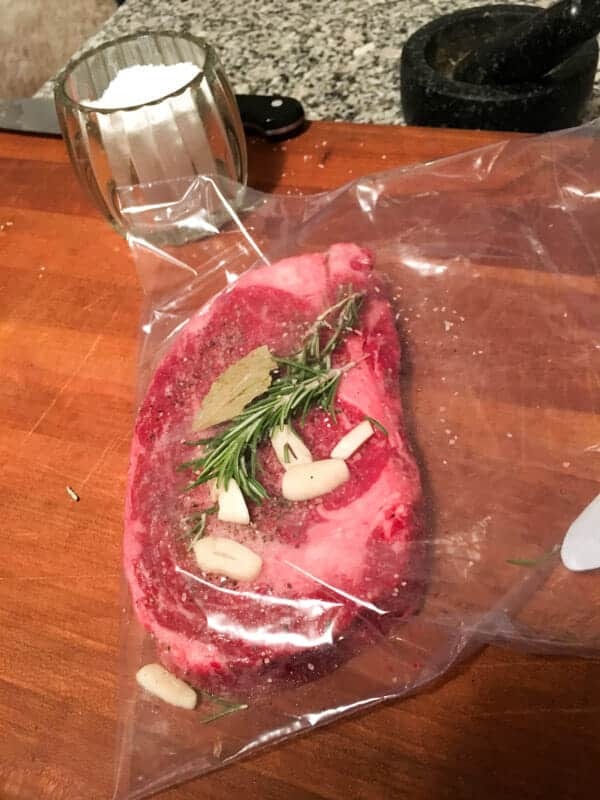 Betsy and I usually will go out to eat for birthdays, but this year we were just too busy and tired so I made some really good birthday steaks using my new sous vide machine. I used the Serious Eats tutorial and loved the results. 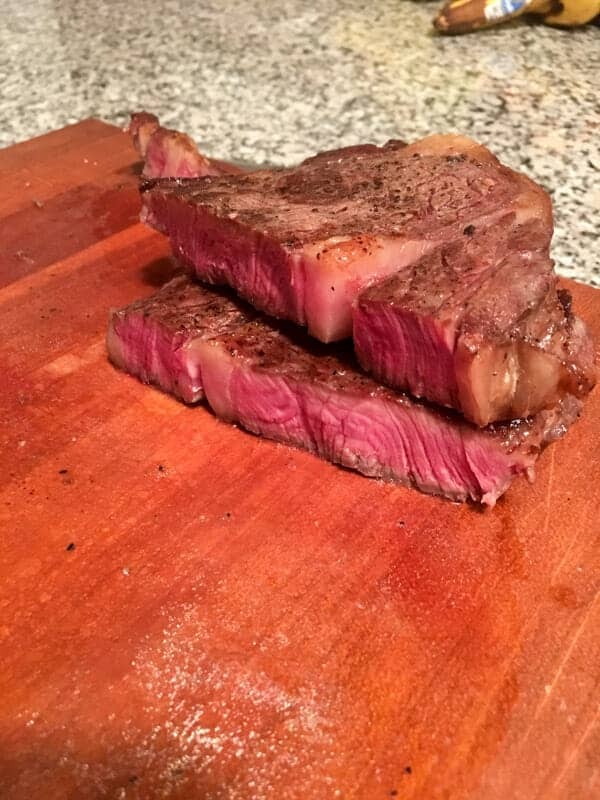 Bets said they were one of the best steaks I’ve made so I’ll take it! I’m a perfectionist when it comes to steak and think I could’ve gotten a bit more sear on the outside, but they were cooked perfectly all the way through thanks to the Joule. Happy birthday to me, indeed! Even though it has been unseasonable warm in Denver this Winter, we haven’t avoided the winter crud in our house. I actually have a hard time remembering when someone in the house wasn’t sick. It has been constant. 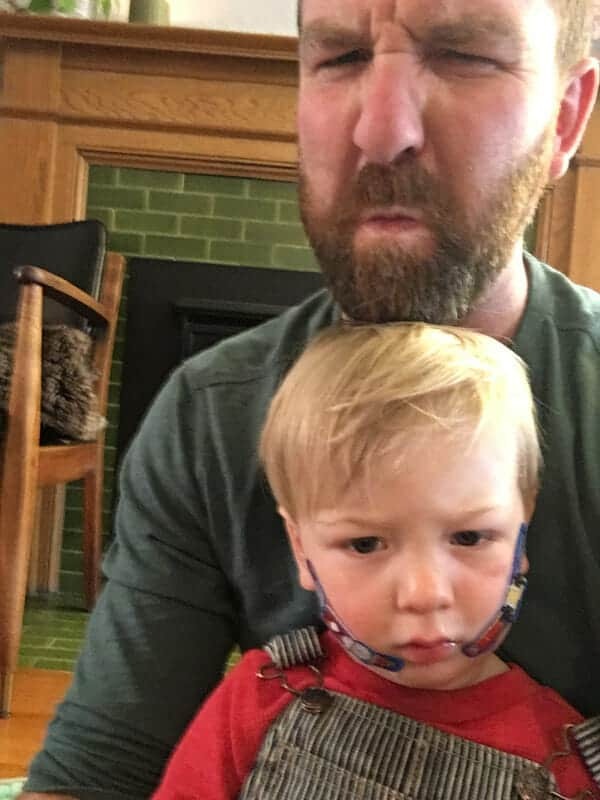 One most recent iteration started when Theo requested double band-aids on his face. I interpreted this to mean he was teething, but no. It means he had strep throat. When I look back at this photo, that makes sense. After that, Betsy was sick, I had (and still have to some degree) a sinus infection, and now Theo is sick again. 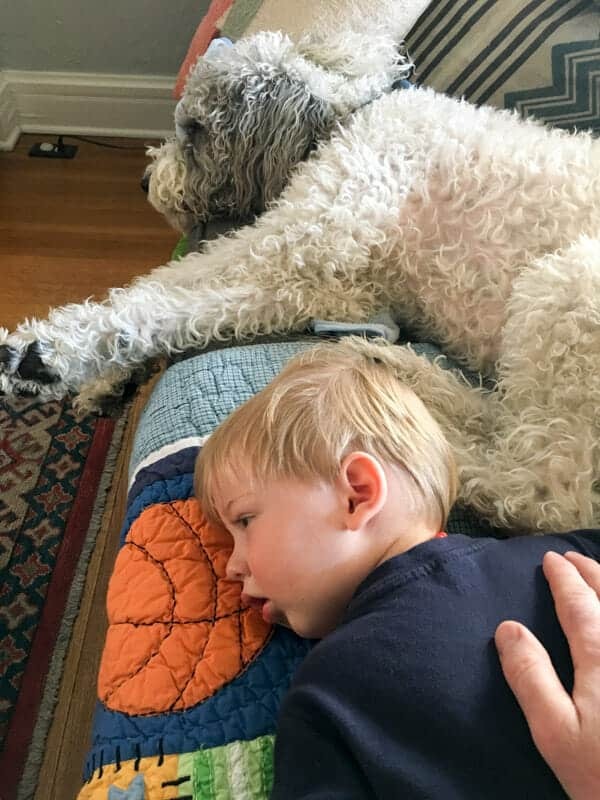 One thing is true, when Theo is sick, Porter won’t leave his side which is pretty adorable. To beat down this round, I’ve gone old school. Lots of chicken noodle soup is happening as I write this post! The silver lining is somehow Darby has avoided getting sick in all of this. Here’s to hopefully healthier days ahead and lots more baby smiles! Nick, thank you for sharing the great pictures. I am going to watch the sous vide tutorial. A friend has one and she swears by it. Grilled the shishito peppers from your recipe but used a yogurt, Dijon mustard and sriacha dipping sauce. Soooo good. 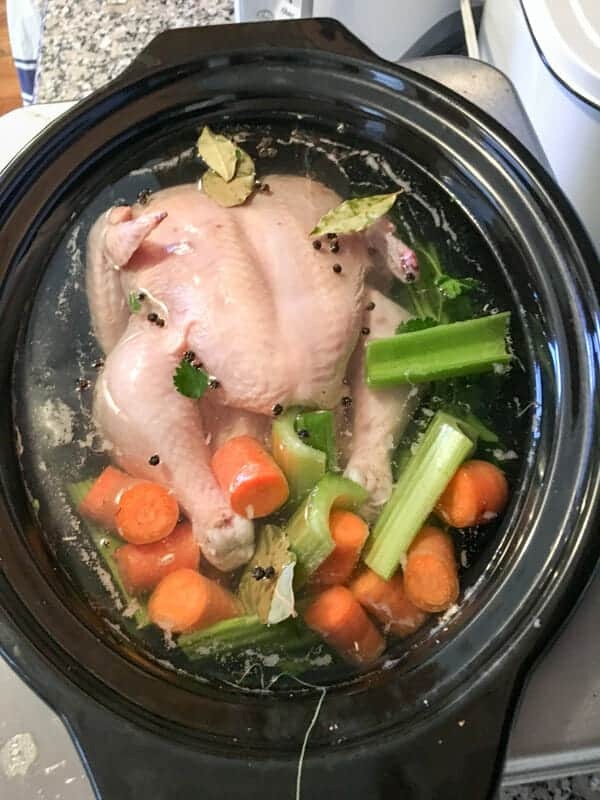 I had to make some Dr. Macheesmo chicken soup last month for my sickies here! Have you changed the recipe at all since you first posted it back in the day? A sous vide machine makes a wonderful birthday treat… and now I feel like chicken soup even though it’s quite warm today!